Come See Us at IAFC Conference & Expo - Krown Manufacturing, Inc.
Krown Mfg will have a booth at this year’s Annual FRI Conference & Expo. FRI, the annual conference and expo of the IAFC, has provided senior-level leadership training for 140 years. 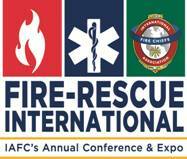 As an organization, the IAFC represents the world’s leading experts in the first responder community. The IAFC’s commitment to excellence is seen throughout FRI—from the classroom to the expo, the IAFC delivers when it comes to quality and value.